A Montecito resident searches his home for the first time near East Valley Road in Montecito, Calif., Jan. 25, 2018. Taking stock of their lives and remembering those who were lost, emotional residents Thursday trickled back to the California coastal town that was devastated two weeks ago by mudslides that killed at least 21 people and destroyed more than a hundred homes. Santa Barbara County officials finally lifted evacuation orders this week for about 1,600 people in the hillside enclave of Montecito, while thousands of others waited for word that it was safe to return. Sheriff’s deputies drove vans full of evacuees back to their homes. The owners of those that were heavily damaged or destroyed were allowed to briefly search the rubble for precious belongings. 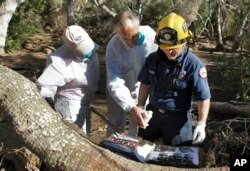 Paige Beard, from left, Curtis Skene and Montecito Fire Paramedic Kurt Hickman try to identify a photo album found in the debris near East Valley Road in Montecito, Calif., Jan. 25, 2018. Skene fought back tears as firefighters uncovered old photographs of his father in his home. Curtis Skene fought back tears as firefighters uncovered old photographs of his father in the ruins of his home. Eric and Pamela Arneson found their home still standing. While he dug through their refrigerator, throwing away spoiled food and chuckling at how bad it smelled, she took notes on each item to submit to their insurance company. The couple initially remained in their home after the mudslides but later stayed with friends and in a hotel when their electricity was shut off a few days later. “We can’t feel sorry for ourselves. Our lives are OK. Our house is OK,” Eric Arneson said. The couple bought their home in 1972 and had attended church with John McManigal, who died in the mudslides. “He was the rock of our church,” Pamela Arneson said. 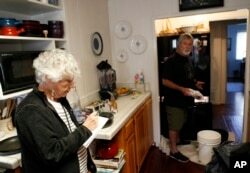 Pamela Arneson writes down the food that was lost as Eric Arneson, 72, cleans out the refrigerator after returning to their home for the first time in almost two weeks in Montecito, Calif., Jan. 25, 2018. Authorities warned that the returns would be gradual and many people would have to stay out until at least the end of the month. The town’s narrow streets were clogged with bulldozers and utility trucks as crews remove mud and boulders and rebuild drainage pipes and power lines. Utility workers are also busy restoring water and sewage pipes, gas service and electricity. Montecito was hit by debris-laden flash floods Jan. 9 when downpours from a storm hit mountain slopes burned bare by a huge wildfire. Hundreds of homes were damaged. A 17-year-old boy and 2-year-old girl remain missing. The majority of residents and businesses in and around the town of about 9,000 people have yet to receive an all-clear advisory. On Thursday attorneys announced a class-action lawsuit they have filed on behalf of a group of Montecito residents and business owners. They are suing the utility Southern California Edison, saying it had a role in starting the fire that led to the subsequent displacement and devastation. It comes after a similar lawsuit filed last week that names Edison and a Montecito local utility. Officials have not given a cause of the fire, and Edison says it’s premature to speculate on the litigation before the investigation is completed. Village Service Station reopened shortly after the mudslides, providing fuel, food and restrooms for emergency responders. Owner Keith Slocum said Thursday that “it looked like a Third World country” in the days after the disaster but since then crews have made significant progress clearing roads. He’s eager to learn when neighboring businesses will be allowed to reopen.